Dear Gas-fighters – we did it!! Thousands of people over 6 continents took part in almost 100 actions against gas and fracking, as part of the #GasdownFrackdown day of action. We’re in this together. Check out the wrap up video and click this link for the actions photo album. all across England to protest the start of fracking and the imprisonment of three anti-fracking activists. After a few weeks, the anti-fracking activists were released from prison and the fight is as powerful as ever. (transportation terminals are built to ship liquified natural gas – LNG), e.g. protesting the construction of the Krk LNG terminal in Croatia. In Italy, local people organised a colourful and musical sit-in in front of the massive ship that has arrived to start the construction of the offshore section of the TAP pipeline. In Germany, plans to build Germany’s first LNG terminal and Nordstream 2 pipeline came under fire. The link between plastics and fracking was targeted in Spain & the UK, with the help of life size sea creatures. This is a key element of our movement, e.g. in Bolivia, students learned about the gas threat when their teacher organized a session around the Gasdown! In Peru & Mexico, meetings were organized to share knowledge and strategy to fight imposed infrastructure. Of course, Governments also came under fire, for instance in West Australia, where over 600 people rallied in Parliament Square to demand a fracking ban. The Nigerian government was also called to support clean energy instead of oil and gas in a GasdownFrackdown march through Benin. 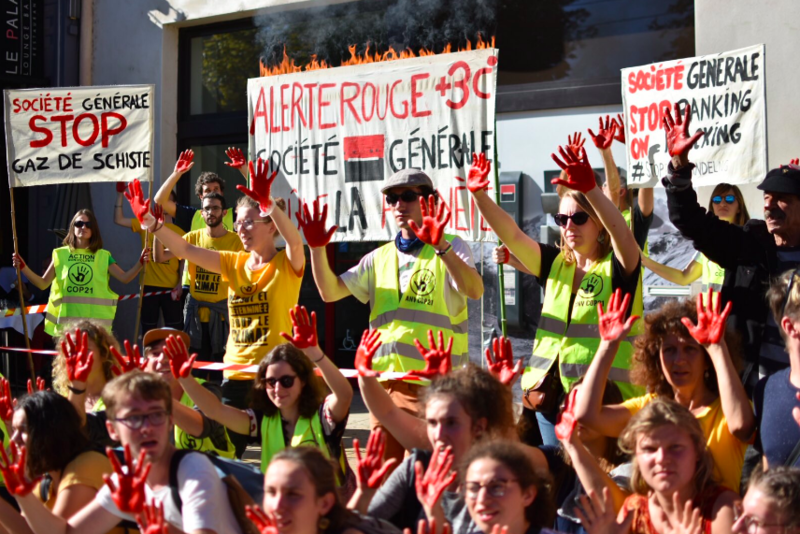 From banners on fire in France to a pop up fracking rig in Indonesia, there are a lot of creative minds in our movement! In London we saw subversive advertising, cleverly replicating advertisements on public transports to surprise people with message on the dangers of gas. Our tactics and strategies are diverse, and our movement is stronger for it. Anti gas and fracking activists are increasingly criminalised and threatened. During the GasdownFrackdown, a number of actions were repressed. In Bali (Indonesia), an anti-fracking rally was shut down by police and activists were held in the police station for several hours. 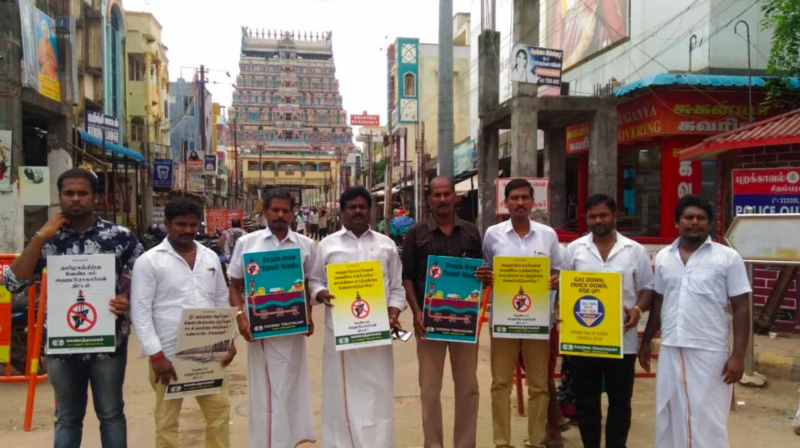 In Tamil Nadu (India), 25 people raising awareness about the risks of gas were arrested for several hours and will now face trial (photo below). Oppression and criminalisation are central barriers to the gas movement – from Mexico, to Italy or the United Kingdom. We recognize that where we live and who we are influences the freedom we have to organise and protest. We stand in solidarity with all those facing police oppression for their activism.